You know you're doing something right when the artisan baker at your local farmers' market wants to swap a loaf of bread for one of yours. 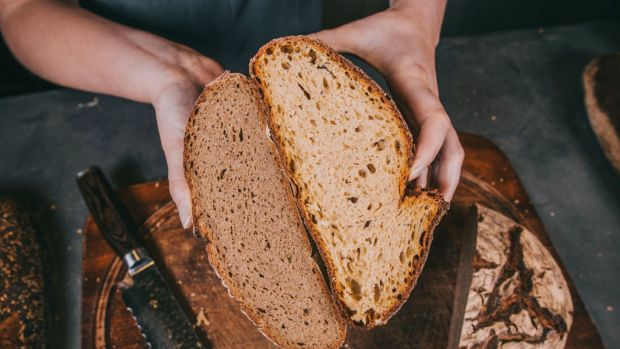 Melbourne resident Nerida Thompson is definitely doing something right; her wholemeal sourdough is light and spongy, and has a fresh, nutty flavour. It's quite unlike any bread I've tried before. So what's her secret? It's not the sourdough class she took 10 years ago. The tips Thompson picked up just didn't translate once she took them home. Her bread was stodgy and dense, so she gave up. The thick stone slab she now bakes her bread on has helped, but the real secret according to Thompson is her flour. Thompson's bread is made from freshly stone-milled, wholegrain, organic wheat flour. She knows it's 100 per cent wholegrain and she knows it's fresh because she mills it herself on a beautiful little machine in her kitchen three times a week. 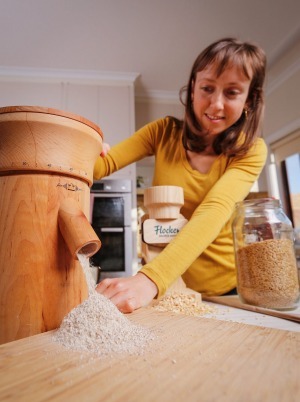 She's one of a small but growing band of Australians who are ditching refined flours and grains, for both health and taste reasons. She has never regretted the decision to purchase a European stone mill for just shy of $600. "As soon as you mill the flour you can smell it," explains Thompson. "It's fresh, almost alive. The aroma is complex. You just can't smell these things in other flours." Feeding her sourdough levain fresh-milled wholegrain flour has also invigorated it and helped her reach the holy grail of bread-making; a well-fermented, natural sourdough loaf that is tasty, satisfying and yet spongy. There's just no going back. "I don't know how kids survive a school day with just a sandwich made with bread from a franchise bakery or supermarket. If you squeeze a slice of their wholemeal or white bread, it reduces to a small ball. It's just got no substance, and no taste." She swaps her bread at the Coburg Farmers' Market with David Allan, of Flinders Sourdough. "When I eat my bread or David's bread I savour each mouthful. In cafes, the bread is just for soaking up the juices or a platform for other ingredients." For his part, Allan says that while Thompson's bread may not always look perfect, "it is really full-flavoured and really nutritious". Allan says baking with 100 per cent wholegrain, stoneground flour is more difficult. Commercial flours milled on modern roller mills contain smaller bran particles (or no bran, in the case of white flour). Bran is high in dietary fibre and other nutrients but its presence results in denser bread because sharp bran particles "pop" the gluten bubbles that form as bread dough develops. Sourdough bakers who use a high proportion of stonemilled flour have various tricks to achieve a good rise. They might add extra water to increase the formation of gluten bonds during the proving stage, or delay adding salt. Many dilute their mix with more refined (or whiter) flour. They also tend to ferment (or prove) the bread for longer. Bread that does not rely on commercial yeast strains for a quick rise is easier to digest, especially for those who have trouble with gluten, because the gluten breaks down almost fully before the bread is baked. There are other health benefits to making bread the old-fashioned way, as well-known dietitian Joanna McMillan explains: "When you stone grind the wholegrain instead – as we would have done in days gone past – and especially if you do this yourself at home, the result is a more rustic bread with a significantly higher level of an array of nutrients, much higher fibre and a far lower GI." "Wholegrain consumption is associated with a reduction in chronic disease risk, while refined grains can increase risk. "The fibre of wholegrains is especially important as it contains a high level of prebiotic fibres that fuel the good bacteria in the gut, driving their growth. This is essential for good gut health … but has a knock-on effect on both mental and physical health. "When you mill flour and sift it you lose all the fibre and nutrients found in the outer parts of the grain kernel (the bran and wheat germ)," McMillan adds. Eating a lot of refined flour can also contribute to blood sugar issues and weight gain. Modern mills "mill the starchy centre of the grain so finely the end result is a bread with an extremely high GI (glycemic index). The flour is so fine that our digestive enzymes attack the starch very quickly, leading to a rapid and large rise in blood glucose levels." Fiona Atkinson, from Sydney University's Glycemic Index Research Service, puts it this way. "The more you physically disrupt the original food form or structure, the more susceptible you make the product to enzyme attack, resulting in easier digestion and a larger postprandial response…Generally speaking, the more intact grains the lower the glycemic response. The impact of particle size has also been demonstrated in other food types, such as porridge made from intact barley kernels versus milled barley kernels and even eating a whole apple versus apple puree versus apple juice." The bakers, chefs and wholegrain suppliers Good Food spoke with say there is a growing appreciation of the health and flavour implications of going slow with bread. It's not just stone-milling and sourdough techniques that are gaining favour, heirloom wheat varieties are also back in fashion. Stone milling is common in Europe and increasingly so in the United States where benchmark bakeries such as San Francisco's Tartine are leading the charge. Thompson purchased her small mill from Melbourne's Bee Sustainable, which imports the Waldner brand from Austria. More recently she's also invested in a hand mill for rolling other grains such as oats. Waldner's Jutta Jester says the company sells thousands of domestic and commercial mills in Europe each year with millstones that range in size from 15 centimetres diameter to 150 centimetres. "Most bakeries in Austria have a mill," she says, because health-conscious customers want to buy "wholegrain scones and bread" along with more refined products. "In Europe, a balanced diet is very important. Many people use their own mill, not only for baking but also for wholefood cuisine… Using wholegrain is perfect [because] you maintain the vitamins, micronutrients and minerals." The use of fresh-milled flour and groats (whole grains that include the germ and bran) is common in households. Meanwhile, in Australia terms such as "house-milled flour" and "hand-rolled oats" are beginning to appear on menus as chefs and bakers seize more control over ingredients. Bragging rights for the largest in-house mill probably go to Sydney's Dust Bakery, which opened in September 2016 at the historic Raceway development. Dust is centred around a large Osteroller, which can grind up to 60 kilograms of flour an hour (Thompson's mill can produce 120 grams a minute, or just over 7 kilograms an hour). Owner Cesare Salemi is a crusader for wholegrain bread. 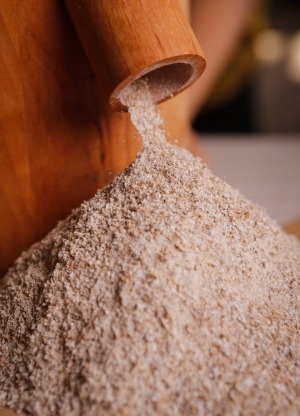 Dust's products are made from flour milled on site, or sourced from Wholegrain Milling in Gunnedah. Wholegrain Milling's Craig Neale says the company's stoneground flour sales are growing at the rate of 200 tonnes each year. This is despite the fact it is "only the true dedicated artisan that uses stoneground flour," he says. Salemi is a third-generation bread maker who in 2006 sold the family business, which by then was a supplier to one of Australia's large supermarket chains. His parents, inspired by memories of Italy, built a wood-fired oven in their backyard and the family, suddenly free of the pressures of running a business, began baking bread the traditional way. His mother recalled how, growing up in Calabria, her family would "buy grain and take it to the local mill, then visit the lady who looked after the 'mother yeast' or levain." "We went from making thousands of loaves every day to baking just a few" Salemi recalls. When he tried freshly-milled flour his conversion from industrial-scale baking was complete. "When you put your hand through stone-milled flour your senses go through the roof… From then on everything else is missing something." He compares it to picking an apple off the tree. "Wheat is not white. It's not supposed to be. A roller mill takes all the brown off the grain and breaks it down gradually 16-20 times. You knock the bran off, then you knock the wheat germ off and then the endosperm (centre of the grain) is refined right down. But with a stone mill you can't do that…"
Salemi says wheat germ is the "superfood". "It's the part of the grain that shoots off to reproduce and is highly nutritious. The enzyme activity in fresh-milled flour is huge and the difference is a beautiful bread with a complex flavour and a nice chewy crumb. You don't need any softeners. You don't need agents." One downside to freshly-milled wholegrain flour is its short shelf life. Wheat germ is rich in nutritious oil, which begins to spoil after being stripped of its protective bran case and exposed to oxygen. Bakers who use it must keep the flour below 4C and then use it by month's end. However, as Neale points out, some bakers want their flour aged. "Some love it fresh (milled), others claim it matures like wine and is better with a couple of weeks' ageing." The logistics of milling and storing fresh flour have not deterred Michael James, of Melbourne's Tivoli Road bakery. James owns a mill and plans on buying a second to complement the flours he buys from a handful of Australia's commercial-scale stone millers. "After America I came back and everything tasted so bland. When you're using freshly stonemilled flour the character of flavour is so much more pronounced… You can taste the grain; that strong, wheaty flavour." Former Tivoli Road pastry chef Jo Barrett now shares a kitchen at the Oakridge Winery in Victoria's Yarra Valley with her partner, chef Matt Stone. They have two mills; one for flour and one for rolling other grains such as barley and rye. This year the couple grew their own corn and milled it to make polenta and corn crisps for a dessert dish. Barrett has customers at the winery's restaurant who usually have trouble digesting bread. However, they find her bread – made from a mix of 40 per cent wholegrain flour milled at Oakridge, and 60 per cent bakers' flour sourced from West Australia's Eden Valley mill – does not upset their stomachs. Barrett keeps her dough in the fridge to allow it to develop slowly and fully. 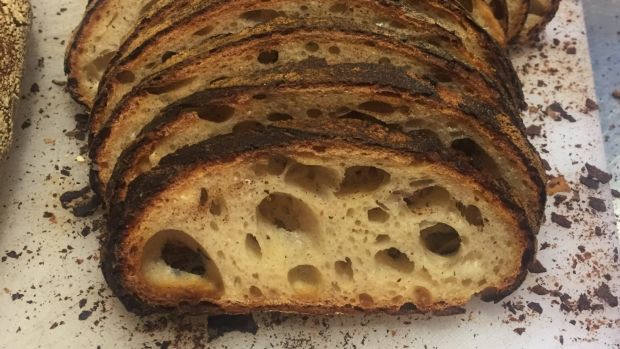 "If you allow it to rise too quickly it might over-ferment which weakens the gluten structure and the bread will be too dense and over-soured," she explains. 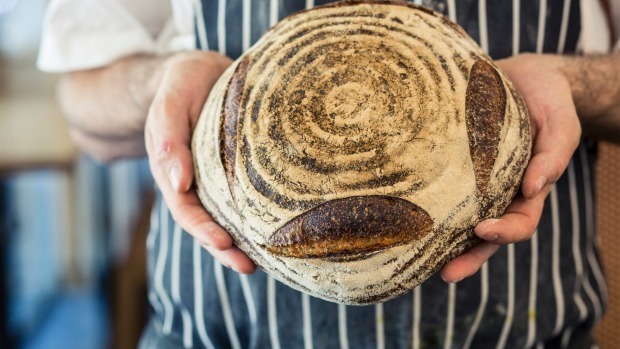 At artisan bakery Flinders Sourdough, co-owner Allan does not have the capacity to mill his own flour and sources stone-milled flour from Wholegrain Milling and Victoria's Powlett Hill. He loves swapping bread with regular customer Thompson. Thompson's bread is occasionally over-proved, he says, "with the odd crack in the surface". But this is a sign of a long ferment whereby the gluten has completely broken down to the point where the bread is almost starting to fall apart. "It's completely natural," he says. 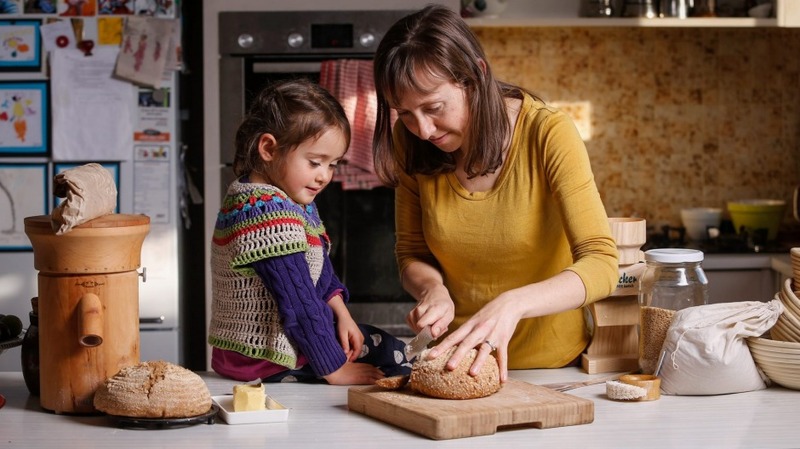 Thompson has settled for adding 10 per cent white flour to her bread mix, and says she was prompted to learn more about traditional bread-making when her daughter, now four, began eating solids. "Bread is something that people eat a lot of… I was always pretty healthy but suddenly I felt this responsibility to feed [my family] the healthiest food I could." Her bread is popular with her neighbours and friends. "Every time I bake I make two loaves – one for us and one to give away. "I find it so satisfying making bread from such simple ingredients and feeding it to my family and sharing it with friends." And just like that – slowly, slowly – the word on #realbread is getting out.